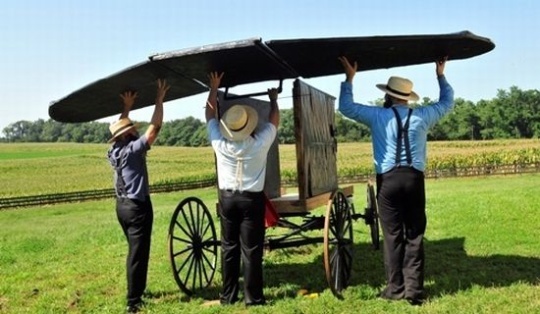 My Amish friend Aaron recently informed me of a curious entry into the Red Bull Flugtag contest. But first, Aaron had to explain what Flugtag actually is. Flugtag is a “flight” competition the Austrian energy drink* maker puts on each year. Teams ride homemade contraptions down a 30-foot high ramp, jumping and soaring into water below. “Flugtag” (pronounced “flewg tallg”) means “fly day” in German, and fits well with the company’s slogan “Red Bull gives you wings”. "Ack, no I don't read Chinese either. I think this goes here?" No telling if aeronautical carriages will end up the next hot item in Amish buggy shops. It did give me a chance to recall Amish rules on flying, however. *Aaron and I have struck upon a foolproof business plan. We are coming up with a Lancaster County-themed energy drink. Look, it had to happen sometime. My business partner and I are currently accepting nominations for names. So far we have thunk up “Red Mule” and “Yoderade”. Somehow, I’m not sure those are going to cut it. Help us out with ideas, would you? 24 responses to Do Amish have wings? Straw Hat?? Wait! That’s a taco salad. Things have funny names in Iowa. I’ll stay up late thunking about this. I am sure of it. Katie, Kim, thank you for thunking about this. Kim I like all of yours but Horse Power is nice in its simplicity. There could be a few flavors and the stronger versions could be rated more horses, for instance. I’ll think of more too, or something different. Love Yoderade! Shrocket works. Or maybe CHURN – you know, like butter. Something for us hard working ladies! Corner Ball-as good as the real thing. Yes, I am being punny with a reference to Coca-Cola and the game. Veering dangerously off topic, “Plow Star” sounds like a reality television series in line with international programs like “Pawn Stars”. Maybe some film friendly Amish (or perhaps New Orders) should do a season and see how it works. I’m sure there have been stranger ideas. Yeah, it sounds like “Coke” if only for similarity, but nicely Amish, I think. Montag Energy Drink: Give your Monday some fuel. Excuse me, I think that I was wrong. The alternate for VPX is probably pronounced as VEE-GAES (How are you?/How’s it going? in German. I was taught to say it, but not spell it.). My bad! Leave a reply to Do Amish have wings?